Happy Monday everyone! Hope you had a restful and enjoyable weekend! I know I will be counting the days this week in a very impatient count down for this Saturday as we will finally be able to bring our Eleanor home!! For this weeks mani I decided to revisit a manicure I did last week but switched up the glitter gradient. I'm really digging the look for the coming Christmas season! I was feeling inspired looking at Angel Wing's golden glitter and knew I had to redo the glitter gradient mani with this color! I definitely think the red & gold combo capture the Christmas spirit! 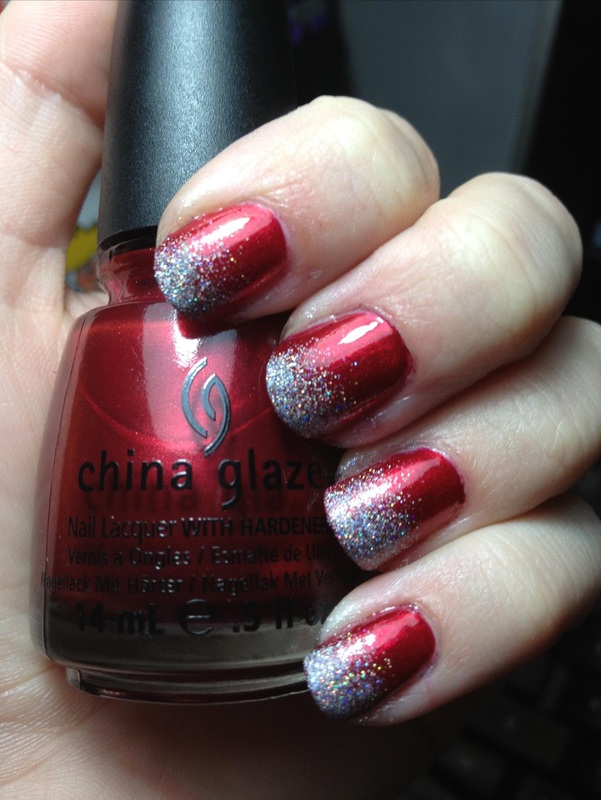 Cranberry Splash is a beautiful shimmery red color that is perfect for the Christmas season and I really like the formula. It applies smooth and very opaque with just one coat. Angel Wings is a holographic gold and shimmers and sparkles like crazy! Decided to do an Instagram tutorial since I've been lacking on YouTube. Sorry guys! Taking a makeup sponge and China Glaze :: Angel Wings begin to dab at nail ends and slowly work up your nail till is forms a glitter gradient. Apply 2 coats of top coat so the glitter doesn't fill rough. I love using inm's out the door and bam you're done! If you try this look I'd love to see!! Hash tag #NskiBeauty if you do!